Undisputed drum & bass royalty, any accolades Friction has failed to pick up probably aren't worth having at all. Known for his incendiary DJ sets which generally stretch three decks to breaking point, seeing Friction tear it up is a rite of passage for any self-respecting d&b head. Check out his 100,000 mix HERE to see what the fuss is about. Representing the new school of drum & bass, the Devonshire boys crept up on the scene with a number of certified bangers, before exploding in a flurry of YouTube hits as their Hospital Records output put them at the top of billings the world over. Marky has been involved with drum & bass since 1992, when he set about turning the scene on its head. Drawing on his Brazilian roots to add a whole new flavour to the genre, he has been at the forefront of its development ever since. LTJ Bukem is widely held to be the godfather of drum & bass, and with good reason; more than 25 years in and around the underground scene is an achievement in itself. But when you consider the fact that he almost single-handedly launched the genre into the global sensation it is today, via the decks and the studio, you have to wonder if 'godfather' is praise enough. One is DJ Fresh, one is dBridge. But together, and aided by Vegas and Maldini, they are Bad Company, a d&b colllective which is somehow even more than the sum of its formidable parts. Responsible for the genre-defining 'The Nine' amongst a slew of others, they are playing a classics set which should be nothing short of breathtaking. 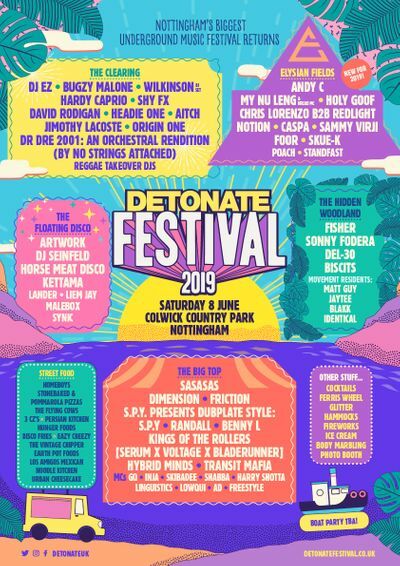 Joining these acts on the bill is Detonate's own Transit Mafia, and a b2b set from Ed:it and J:Daure. Passing the mic around are AD, Linguistics, Script, Ruthless and Freestyle.